HOUSTON -- All of the Christmas festivities are done and the New Year is here, now it's time to get rid of all that clutter and get yourself and your house organized for the New Year. It doesn't have to cost a fortune to get organized, and you may have everything you need from all of your Christmas leftovers like boxes, cards and tissue paper. You can also pick up some great items at your local Container store to store all of your Christmas decorations and wrapping products in. For more ideas, check out my blogs on www.craftingwithadeina.com. First you want to decide what you are going to organize, start with all the new toys that the kids got, or all the new clothes that you got. Whatever the items are, you will want to get boxes that you can put the items in. I started with the Lego's and Nerf Guns and bullets. Whether you are going to create the stackable storage boxes or the drawer boxes, you will want to gather all of your boxes ahead of time. Next, tape the box so that the sides and bottom are secure, if you are going to make the drawer box, create the shelving for the drawers by taping a shelf into the middle of the big box for the drawers to slide in and out of it. To make the drawers, tape the sides and bottom, don't tape the top, cut the top off. Now paint the outside of the box, you can make it all one color, different colors or create a design, this is your project so have fun with it. After you have painted the box and let it dry, take a picture of the toy and print the pictures onto copy paper, then decou page the picture of the toy to the front of the box. You can then hot glue a 3" strip of ribbon to the front of the box/drawer as the handle. Let everything dry and fill them with your items. This project is a great way to save those beautiful cards that your friends and family gave you. 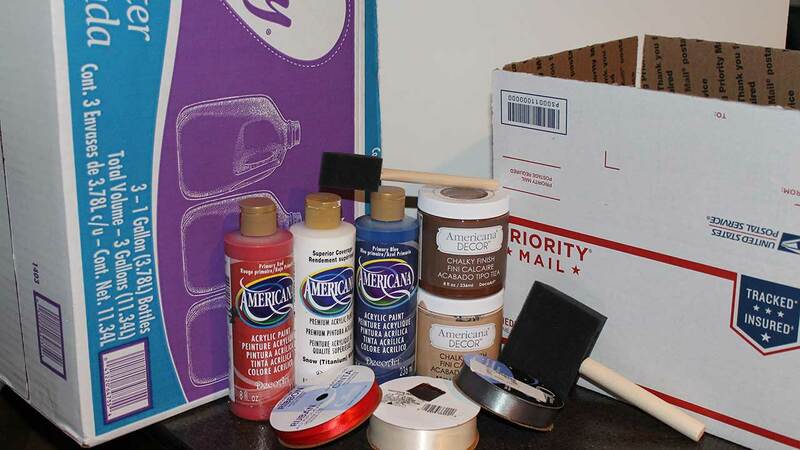 First, decide if you are going to decorate with canvas or cardboard, either will work and look great. To begin, take your family picture Christmas cards and cut out the pictures. Next, either paint the canvas or the cardboard with a color that will match your home dcor, this is an item that could stay up year around. You can take your other Christmas cards and create picture framing for a nice decorative touch to your pictures. After the paint is dry, start to decou page your Christmas card frames and pictures to the painted canvas or cardboard. Let it dry and then hot glue a strip of ribbon to the back of the finished project and hang on your wall. You can also frame your project and place on a shelf or hang on the wall. To store all of your Christmas decor and wrapping items, head over to your local Container store and pick up some ornament storage and wrapping paper storage bins. They even have storage containers for those beautiful wreaths that you have.